WHY DO YOU NEED THE DEVIL WHEN YOU HAVE LIZ TROTTA? I’ve heard some really stupid things come out of the mouths of overpaid pundits for this ideology or that over the last few years but this one from Liz Trotta at Breitbart.com really takes the cake. Trotta’s commentary states that since people don’t believe in the devil anymore society is just going to keep getting worse and worse. That really means that conservatives are going to keep losing culture war battles over things that the young people and moderates, you know the folks who really make the decisions about society in America, find fully acceptable. As you, loyal reader, know, I am a citizen in good standing, gainfully employed in the breathtaking capitol city of Hell, Dis. If there’s one thing I know about, with a personal certainty it’s what the state of Old Scratch is. The tyrant who once ruled all twenty city-states of Hell, what you Living folks call the Afterlife on its own special plane of existence with its own cool new rule book, no longer exists having been cast into Oblivion just over 14 Terran standard years ago. Now I know there are conservatives and their most vitriolic bigoted fringe of white male Dominionists that will never accept that this is the case because it doesn’t play well with their end time needs. To them all I can say is sorry for your bad luck pal. Yet and still these people believe in talking snakes, talking fiery bushes and a rapture that isn’t even in the Bible but was made up nearly out of whole cloth in the 1830s. That aside for the moment at least I have to admit that Trotta is moving in the right direction when she says, “Our need to be shocked, though, has spiraled out of control, and death surrounds everyone, especially the children.” The thread is lost when she doesn’t go into why all the guns? Or why not decriminalize marijuana and cocaine? Or why do conservative pundits have to push the fear button every time? Instead Liz Trotta starts to whine and drone on about things in popular culture that she finds annoying or offensive. Liz Trotta does not care about what children see or do her job, her only job is to put a seed of fear in the minds of middle aged white men and women who already feel that the country they are living in is somehow less free, less safe and less prosperous simply because Barack Obama is president and his face is not white. This commentary by Trotta ought to be must see TV for every Progressive young person who gives any thought to what the real motivations of the Conservative movement are. I like the analogy that the GOP is on its way to becoming a “zombie party” having been infected with the TEA Party virus they are now running around foaming at the mouth like the crazed undead from the Resident Evil movie franchise. 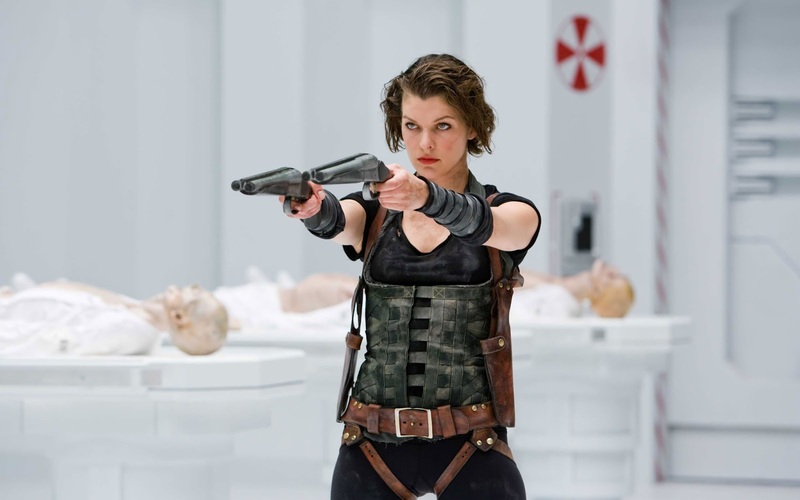 [Note to Milla Jovovich: I know these movies pay you a shitload of money but I’d really like to see you “act” again.–V.D.] The chief reason for the concentration of this virus among a single nearly homogeneous demographic is because of delivery systems like Liz Trotta. Why do moderates and Progressives not fall for this nonsense? Well for the most part we;ve built up and immunity to the Limbaugh strain, the Coulter strain and the Hannity strain after many years of constant exposure. But wait! There’s hope! For any conservatives out there hoping they could cure themselves of possibly save their children from becoming political zombies as well I hear a little drug called Reason works every time and has a double effect it relieves the symptoms of bigotry brought on out of anger that one is simply middle class and middle aged. Most of you who read my articles know that I am a Progressive. The question posed by The majordomo this morning was exactly the one I’ve been asking conservatives all over Hell for the last 9 days. If ObamaCare is busted and won’t work, why are you guys trying to defund it? The clearest answer is the right is fearful that ObamaCare will work and come to be applauded as President Obama’s signature accomplishment in the future. Couple this with the facts that the base of the GOP is literally dying right out from under them and you have a perfect fetid swamp that can grow all manner of political crazies from Rand Paul to Ted Cruz to Michele Bachmann. End times? Really? I feel it’s high time to do what Coco is doing up there and put all the cards on the table. First, the GOP needs to grow up and realize that ObamaCare is the law of the land. Second, the administration needs to get someone, anyone to fix what’s wrong with the ObamaCare website and do that soon rather than later. But for the government shutdown this would have been the lead story for the past nine days. If it was possible for a political party to shoot themselves in the foot after shooting themselves in the head this is it. The terror of a few Congressmen being primaried caused the GOP to blow what should have been its biggest political public relations victory in decades. Now Boehner is trapped and likely won’t make it ti 2014 as Speaker. With 2016 looming right around the corner it would take aliens landing on Terra for there to be a GOP majority in both houses of Congress and a GOP president in the White House. Maybe they need to take that 2012 autopsy out and read it again. This was the quote that tied the Blow piece together for me, but it doesn’t come close to scratching the surface of a solution set to the GOP’s problem with those who have driven drunk on ideological purity past the exit for Conservatism, ignored the road washed out signs and are heading on the long journey toward political illegitimacy in a car called Reactionary. The quote from the Kohut article in the Washington Post that rings truest was that the Democrats in 1973 were branded as the party of “acid, abortion and amnesty.” Now the GOP has been, by its insistence on demagoguery over details and purity of ideology over the people and their needs, has become, to many Americans the party of “Religion, rifles and returning to the 1950s.”Someone call the alliteration police, please. The solution for the GOP is the same solution the Democrats used to win in 1976. They found an honest man who could hold the place in the White House for four years. But for the economy and foreign policy failure in Iran James Earl Carter Jr would have been a two term president. Carter may be forgotten as a president in one hundred years or so cast into the same bin of “oh those guys” where Millard Fillmore and James Garfield reside, but he really shouldn’t be. Carter, being a Southern governor forced the GOP into an alliance that was backward looking rather than forward thinking. To get the White House back and to appear more appealing to the conservatives still feeling stung by the crimes of Richard Nixon the GOP establishment made what is the closest thing politically to making a deal with the Devil– they got in bed with fundamentalism in the form of the Moral Majority.